This is just a fragment of less than two minutes of film. 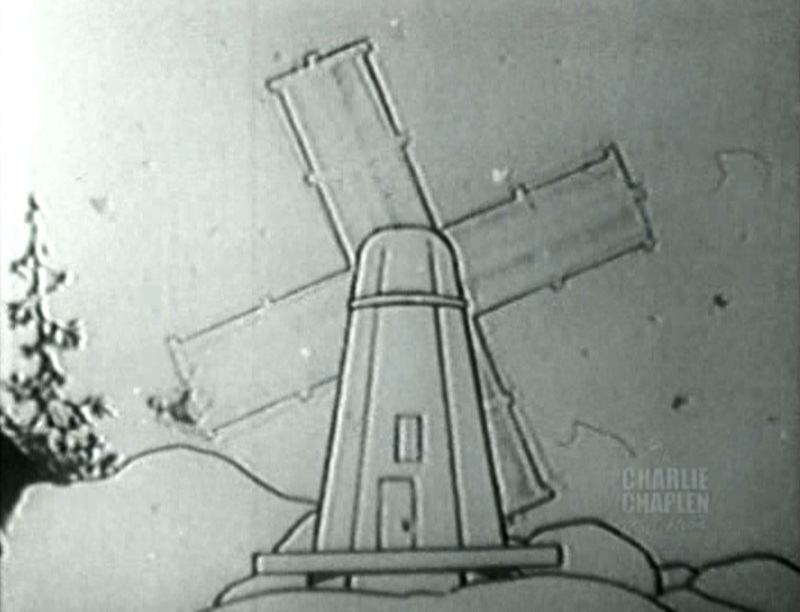 What we see, mostly, is a very large windmill going around and around with a tiny figure clinging to one of the sails. When it stops, with him at the top, a fat man on the ground blows a big wind and makes it turn around a couple more times. 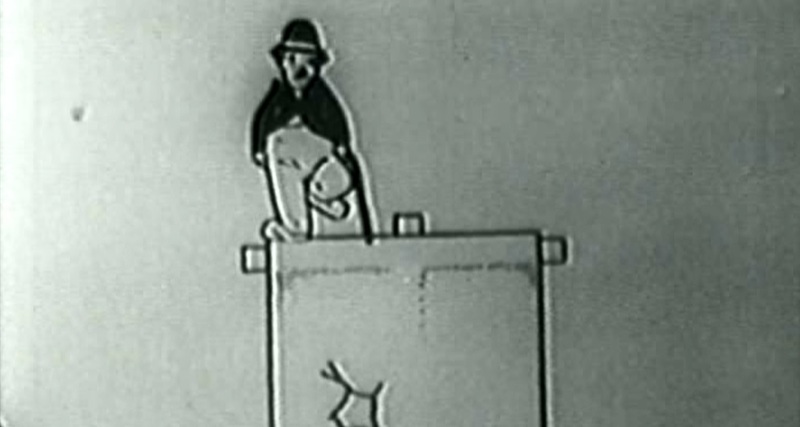 Then it stops again, and we get a close enough shot to see the cartoon version of Charlie’s “Little Tramp.” He gives his signature shrug, and several other familiar body movements, while the fat man, now joined by a woman, throws bricks at him! All of them miss, but when the man throws a bicycle, it knocks Charlie off. That’s all we have. The DVD collection that I found this on says that it is from 1915, and that is confirmed by the library at UC Santa Cruz, which claims to have the original in its collection. Libraries usually try to be as accurate as possible about the materials they hold, but I’m not sure, if all they have is this tiny fragment with no titles, how certain they are in this case. The DVD credits Otto Messmer and the library Pat Sullivan, which is ironic, because it mimics the debate as to which of the two of them “created” Felix the Cat. Let’s assume that this was produced by Sullivan and animated by Messmer, that works. In researching their early collaborations, however, I found an animated Charlie Chaplin film that Wikipedia dates to 1919. Wikipedia is certainly capable of error (and the url on the movie suggests that someone thought it was 1916 at some point), but I find this later date more believable for a couple of reasons. The first is that Chaplin was still developing his character in 1915. We see his trademark shrug for the first time, so far as I can tell, in “In the Park,” which was released in March of 1915. Would it already have become so well-known before the end of the year that an animator would know to imitate it? I’m not certain. The second reason, perhaps less compelling, has to do with licensing. In 1915, Sullivan would have had to negotiate with Essanay to use Charlie’s likeness, and I would have expected them to insist on releasing the movie themselves, not through Sullivan’s company. By 1919, negotiations would have been with Charlie directly, and he might have OK’d it without further concern. The reason this may not matter is that given Sullivan’s reputation, it’s quite possible that he didn’t have permission. There were plenty of questionably legal Chaplin imitations running around in the late teens, and this might just be one of them.